In spinster life, today was pretty near perfect. I woke up at 7:45 and worked on an illustration project until I felt it necessary to take a shower, and then I did my laundry. I'm always incredibly surprised how almost none of the things I need to wash are actually clothing. 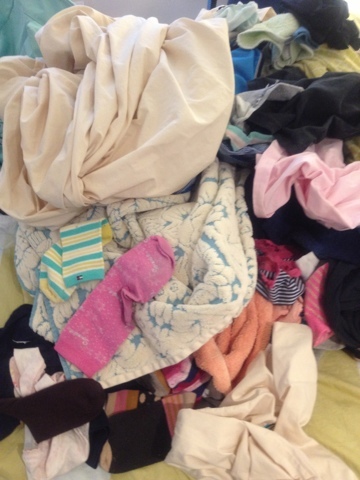 Towels, socks, and underwear make up 90% of three loads of laundry. Really, what do I wear to work? I'm pretty sure I wear clothes at least some of the time. I love doing laundry, though, because it gives me time to read while being outside of my apartment. So, I feel like I'm engaging with the world, but sort of still in a spinsterly way. I think I may be the only person at my laundromat who compulsively needs to use different detergents for each load. But really, you just can't use the same detergent for black clothing and regular clothing. I don't care what you say, they make woolite dark for a reason. And it's a darn good reason. 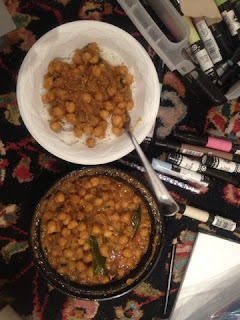 In other news, the Indian Restaurant around the corner from my apartment finally opened, putting me out of my misery with some finality as the Chana Masala was decidedly up to par. However, combined with the chemical stench of my chartpak markers, I may need to sleep with the window open tonight. Good thing I've put on all this blubber for the winter.